Luck and timing may not be everything, but sometimes you just catch a break. Between September 6th, when LG announced the V20 smartphone, and October 28th, when it officially ships in the United States, Samsung's flagship Note7 became a punchline, and the excitement of Google's new Pixel and Pixel XL phones built, crested and abated. Whether or not this was always the intent of LG execs, the air is now cleared to consider the LG V20, a phone worth no small consideration. There are a lot of features of this phone that may put it on your short list. LG's top-of-the-line phones this year share one signature feature: a replaceable battery. Since the original iPhone pioneered sealed batteries nearly 10 years ago, that's been the overwhelming industry direction. Samsung may have been the last vendor to use a removable battery in a top-end phone, and that was for the vintage 2014 Galaxy S5, two generations ago. 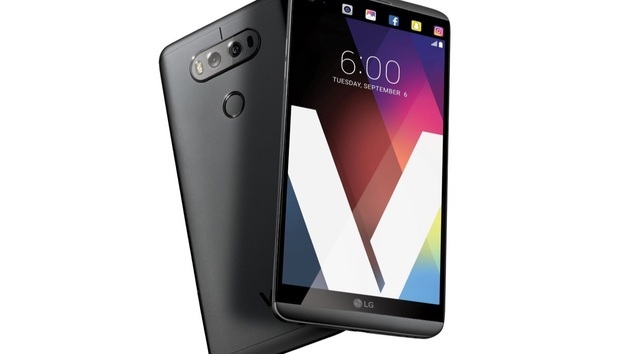 But LG -- first with the G5 and now with the V20 -- revived removables, which have a vocal following. Admittedly, removable batteries (at least done the LG way) do present some design problems. It is still not possible to design a phone that is both water-resistant and that has a replaceable battery -- and the market seems to be headed toward water-resistance. And in an industry that prides itself on a smooth, glassy fit and finish, the V20 has an unmistakable seam between the phone's removable metal back and its glass front. You'll feel the edge every time you hold the phone. If you can get past those design compromises, however, you'll find a phone with a lot of original thinking to recommend it -- if you care to afford it. Like all high-end phones, this one will leave a dent in your wallet. The V20 is driven by a Qualcomm Snapdragon 820 quad-core processor. It's a plus-size phone: 6.3 x 3.1 x 0.3 in., more or less the same as an iPhone 7 Plus. It weighs a touch over 6 oz., about a half-ounce less than the 7 Plus. The 5.7-in. screen is a Quad HD IPS display showing 1440 x 2560 pixels at 513ppi and covered with Gorilla Glass 4. It's okay, but doesn't approach AMOLED screens. The phone's got 4GB of RAM, and you can get it with either 32GB or 64GB of storage -- both of them expandable with a microSD card. The V20 benchmarks strongly, scoring 143891 using the AnTuTu Benchmark, outperforming the Google Pixel XL's 140747 and the Samsung Galaxy S7 Edge's 134599, but significantly behind the iPhone 7 Plus's score of 172644. Its 3,200mAh battery (have I mentioned that it's replaceable?) lasted more than 4 hours in the AnTuTu drain test. Using the included Quick Charge 3.0 wall brick, the phone charged from zero to 100% in under two hours. The back of the phone has two cameras: an 8MP wide-angle camera with a field of 135 degrees, and a 16MP camera with a 75-degree angle and optical image stabilization. The front-facing camera is a 5MP unit with a 120-degree field. The V20 supports Android Pay but not wireless charging. Physically, the phone puts its volume buttons along the left edge, the headphone jack and USB-C socket on the bottom edge, and a button that releases the metal back of the phone on the bottom right edge. A fingerprint sensor/power button is on the back of the phone, typical of LG designs and something I like, although it's not to everyone's taste. There's a slight bulge for the cameras on the back, and very little bezel around the screen. Removing the back cover exposes the battery; you need to remove the battery to get access to the SIM card. That's not really a problem, because SIM cards aren't replaced all that often. A microSD card can be inserted and removed without pulling the battery -- a piece of thoughtful engineering. One of the more interesting features that LG has added is a "second screen" (first seen in its previous LG V10 model). Above the display's main area is a narrow 160-x-1024-pixel screen that shows a clock, a calendar and status icons, even when the main display is asleep. Swiping left or right in that area reveals icons for mute/vibrate, Wi-Fi, flashlight, Bluetooth or a screen capture/drawing utility; swiping again shows audio controls. When the main display is on, the secondary screen shows you the name of the Google account you're logged into; when you're at the home screen, swiping the secondary display shows icons of all your open apps. It's remarkably convenient. The closest analog are the edge functions in the Samsung Galaxy S7 Edge, but they're better implemented here. The LG V20 was the first phone to be announced with Android 7.0 Nougat, and the second -- after the Google's Pixel -- to ship with it in the United States. LG has made some tweaks to the UI. The Settings interface is new-ish in Nougat, and it's instructive to compare the way the V20 implements it with the way the Pixels do. In both, pulling down from the top of the screen shows five frequently used icons; pulling down again shows a 4 x 3 matrix of icons, and tapping a gear icon brings up a complete menu system. But the V20's settings menus seem more extensive because the phone has so many operating options. Another change from classic Android is the lack of an app tray: All apps appear on the home screen, and can be organized into folders. It makes the V20 work like an iPhone - or, at least, an iPhone with widgets, an Android feature LG retained. You may like it, or it may make you crazy. Besides its replaceable battery, LG is making a big deal this year about its phones' audio and video features. With good reason. Most every phone also has a voice memo recorder; LG goes way beyond that. There is a simple voice mode, but the recorder can also save in FLAC, WAV and 3GP formats at sample rates of up to 24/96. It includes a limiter and a low-cut filter, and you can monitor what you're recording through headphones. This is not business as usual. Similarly, the camera offers an uncommon level of control for both still photos and video. As I was picking through the software, I kept thinking I'd found the boundaries of the application only to find yet another set of settings for another set of options. The dual main cameras -- one wide-angle and one normal -- hand off to each other seamlessly as you zoom or pull back. You can zoom either by pinching or by using a slider. The wide-angle camera can save images of up to 8MP; the normal one up to 12MP. Modes include panorama, slo-mo and time-lapse, as well as pop-out and Multiview, which lets you build collages as you snap. You can save images in RAW format, and the 5MP selfie camera has face, gesture and voice control. There are manual modes for both still and video. In video, you can reduce motion blur (or not) and turn on tracking focus (or not), as well as control white balance, focus peaking, ISO and shutter speed. Video resolution goes up to Full HD at 60fps or 4K. It's all a little dizzying, and you'll want to have that microSD card installed. Pricing of the V20 is a little unusual, too. Normally, prices for a single phone model are fairly consistent across most carriers, with a modest premium for off-contract phones direct from the manufacturer. But Verizon's version, at $672, is much cheaper than the approximately $800 all-in price from most of the other carriers. And if you want an unlocked version, B&H Photo sells it for $800. Most of LG's choices ultimately succeed, but the overall impression is one of a product that's a bit out there, still with some rough edges -- literally, with the inescapable seam where the phone's removable back meets its front, and metaphorically, with a non-standard Android interface that may take some getting used to. This is a phone you can have an opinion about. Here's mine: I like it. It's quirky and different, but in a good way. I don't much like the way it feels, but I love the way it works.